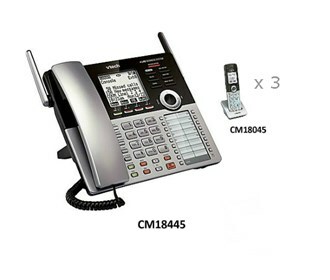 The CM18445 + (3) CM18045 is a corded base phone with cordless handsets. The four line operation phone is packed with the best VTech features and manage calls from 1-4 telephone lines simultaneously. The CM18445 is a full-duplex speakerphone that can keep up with your calls and increase participation by allowing parties on both ends to speak and be heard at the same time. One can store 50 names and numbers caller ID history. Additional features include Digital answering system, voice prompts, memo recording and variable speed playback. The VTech 4-Line Small Business System with 3 Handsets has many exciting features for users of all types. You can extend the lifetime of your VTech 4-Line Small Business System with 3 Handsets with the purchase of a FactoryOutletStore Factory Protection Plan. See the VTech 4-Line Small Business System with 3 Handsets product video and gallery images above for more details. The VTech 4-Line Small Business System with 3 Handsets is sold as a Brand New Unopened Item.